Lyngbakr Lyngwintsyn is a fisherman, storyteller, adventurer, trader and a Warrior by heart. Most of his traits he has been taught by his parents at a young age. Fishing was not only the family's work, but also their gathering and time spending hobby when they have a day off or simply just wanted to enjoy life. Lyngbakr is the eldest of the sibling group of five; two sisters and two brothers, though he is the only one (as far as he knows) that has the 'curse' of the Inner Beast. The first hint of this said 'curse' revealed itself when he was at the age of eight, when he simply had a fit against some bullies that were bullying one of his younger siblings. And once again revealing itself at the age of fourteen, during that rage he almost broke an ancient family heirloom. His mother simply picked him up by his leg and flipped him upside down and growled at him before she tossed him out of the house to let him cool off in the cold, harsh winter weather. As Lyng grew up, the inner beast revealed it self every now and again as he met with great challenges that would make any teenager tremble. Fending off hungry Goobbues, wolves, coeurls, bandits, Rampaging elements and Pirates. Fighting people in the village became a regular thing, though he only fought those who deserved a beating, or defending people who was wronged in his eyes. Roegadyns are not that much of a violent race, but they do like to show off their strength every now and again, Lyng always looked for a challenge to make himself stronger. But one late winter night he bit off more than he could chew; Grabbing that said ancient family heirloom - which was a stone greataxe from way back in his family line - he ventured into the woods alone to try to defeat any foul beasts or evil creatures lurking around. His mother heard the Axe moving from its stand and quickly and silently followed Lyngbakr into the woods without his knowledge. Being from a fishing village in the northern seas made him a true man of the winter, fighting off harsh weather and fog that breaks the sight for any man seeking respite from the storm. He always knew that helping others would bring help to yourself when you needed it, alot of this have changed it seems when he left the village. But the story did not start there when it came to Lyngbakr, no, Rumors has it that he defeated an island with a fleet, seeking vengeance for his loss of crew - which made the loss even bigger when he returned with less ships to the safe haven of his village's docks. This haunted him, it still haunts him, and it does not help that he as a 'curse' - as some people like to call it - called the Inner beast. Pure rage, unflitered, unrefined, full of power which would make any mountain tremble if you saw a man with it. It does not help that Lyngbakr is a Mountain himself and a heavy armored one at that. Lyngbakr got his revenge on that said Island. But so many folks does not believe in him when he tells that story, he simply shakes it off with a smile - "'tis a fishin' storeh, nay?" 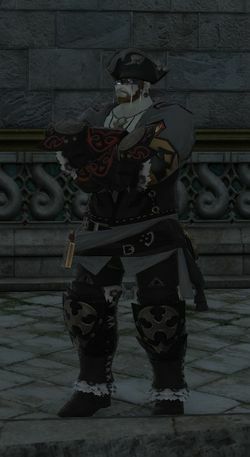 Leaving his village to flee from his own dark past, he sought out a new life in Limsa as a fisherman that made him great profit until he started his own trading company - more or less he just bought the biggest sturdiest ship Limsa could offer and named it 'AhtzaAnka'. Once again, business is blooming and he could focus more on adventuring around Eorzea to see the danger and beauty of the place. After a rather dangerous event that happened couple of moons ago, seeing that his own inner beast defended him when he did not have the strength nor the heart to do so anymore, Lyngbakr started to understand more and more of this 'curse' he had. He did seek out people with the similar issue, most of the folks he has found has been Roegadyns, his own kin. He found this strange as this sounded more and more like it fell back to the rumor's back in Northern sea, a curse. But he only looked at the curse as one when he lost control over it, letting it rampage with his own body as a tool of destruction, practicing and training dicipline alone in the darkness of caves, waterfalls and any other challenging places to hone his skills proved difficult, but he does not give up that easily. Now he is wandering around Eorzea with his love as a Married couple, seeking out knowledge of every war, battle and weapon possible. "Knowledge is half the battle" a person said once, and is often used as Lyng's saying in things, he wants to understand how his enemies think, feel, move with their respective weapons. Be it Spear, Sword and shield, chains or a gun. He will learn how to counter it perfectly. Though, everything seems to be calm for Lyngbakr and his Wife, Ilena. "Nothin' could beat this now" is what Lyngbakr thought several times with a smile on his face when he looks or thinks about his lovely wife. Though it might not be the end for his Inner beast, it lies dormant within him, waiting, contemplating, watching. The beast itself took in most of the combats and lessions from battle far better than Lyng himself, though Lyngbakr does his best when it comes to sparring. It might seem like he is not taking any of the grindstone spar seriously, but he is reading every move, analyzing it and triest to understand the most logical place the enemy would strike at him. Alot of the times he is correct by his assumptions, it is a shame that he is not agile enough to deflect many of the attacks; hence, this is where the Inner beast wakes up. § Lyngbakr loves a challenge in battle, though is rather humble if he defeats his foe in a spar or simply just go silent. § He is not a wordsmith to all, he might even be as blunt as a sledgehammer to get the point across. Yet, he tries his best to explain himself well if he feels he's threading in dangerous and uncharted water. § Lyngbakr is an eavesdropper, he always pay attention to his surroundings as well as movement. During his warrior training he has enhanced his hearing greatly. For better and for worse, thankfully he does not stick his nose where it doesn't belong - that is... depending on the story that is being told. Being a massive creature that rose up at great six point five fulms up into the skies. A rather terrifying look when you first get your eyes upon this pillar of a man, but his voice and laughter truly makes up for his kindness in his heart. Being born and raised in a fishing village up in the Northern Sea where harsh weather roamed, gave his skin of his ancestors a rather sea-green -almost white color. Chiseled muscles revealed on his arms and legs, when they were not hiding behind a massive plating - of what many would call a building because of the size of the attire that suited Lyngbakr. He might seem rather terrorizing at first, almost like he could break you like a twig without even trying, perhaps even just by looking at you. Two scars on his face, one larger than the other that goest from his left side of the forehead, downwards to his upper right cheek across his Right eye. "close call ta blindness" he calls it with a smirk on his face every time. the lesser one is under his left eye, nothing much to say about that as it seems like a dagger tried to aim for his eye but failed. 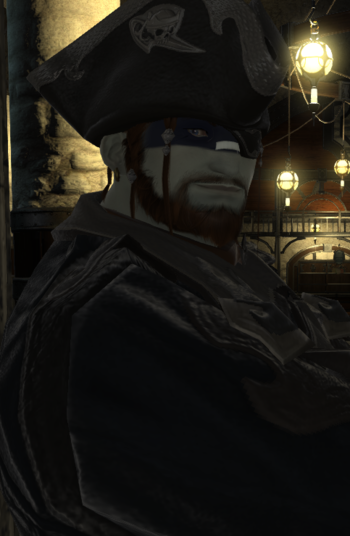 Bright and Kind ocean blue eyes that makes you see the kindness this roegadyn has to offer, some people is terrified of this man before they look upon his eyes. Though if looked into at the right (wrong?) time, you can see the fiery, unfiltered rage burning within, determined to survive. Braided brown haired locks with grey highlights, the grey colouring could be of him getting old - then again, he's only 34 cycles old. It might be more about the things he has been through than anything. He does enjoy taking care of his hair when it comes to braiding. He has experienced in first hand what happens if you let the lose hair free flow in combat. one thing is sure, it made him even more furious during those fights. When it comes to apperance on his body, he is the one who has seen many battles - Visible on his chest (when that's possible), are several scars made by different kinds of weapons it seems. Several of them seems to have been made by a pointy end of weapons, they looked circular with a diameter of two and a half ilm. His chest rather looked like it was used by a pin cushion, or attacked by a rather angry fellow with a spear in his hand. A few ilms shy of one fulm long scar by the left of his waist, that told a story itself. By the looks of his arms and legs, they have minor scars of battle - But not a story to tell about them. Lyngbakr Lyngwintsyn is a Roegadyn that is raised by a fishing village up on the Northen Sea. He might be a harsh person to be around at time, and other times he's the best friend you can ever have. He has strong opinion about certain things and is not afraid of sharing it. He often stands in-between people when there is conflicts in the air, not to be a hero, but to make sure that if someone is getting attacked, they are met with equal force. He is hard and makes those comments out of love. It is his way of showing affection. It means he cares about you. He would never do it if he didn't. ...He would likely simply make a crass remark and leave. OOC Note: Something here if you wish to warn someone on how you combat if you even do this. Lyngbakr's Thoughts: "Ye're me treasure, koel. I 'ave tha most precious star there is in the sky. I 'ave the most precious bein' in me arms, and I will never. let. go." One dark night, one cursed manor was all it took. Ilena has been lurking around Lyng since that day, they occasionally stopped by eachother when they met in Limsa. After a couple of moons later, they became something more than just acquaintance, they became friends in adventuring. The relationship bloomed under the trees of the shroud, shined under the open sky of La noscea, forged by the heat of Thanalan, that held the warmth in the cold Coerthas. What it really means is that through Adventuring, they found the person they have been missing, someone that truely understands and cares for one and other. Lyngbakr's Thoughts: "Tha' lil' bugger can bloody 'ells survive anythin', let 'lone eat anythin'." Lyngbakr's first encounter with this sproutling was pretty much a strange one, he was adventuring around in the shroud for the shortest of times. During that time he met this little bugger when he sat down to eat his poorly made lunch which was made out of stale bread and tomato, the goobbue itself charged forth towards him as it looked like he wanted to scare Lyngbakr away from his meal... Well, scaring a mountain when you are a pebble is not an easy task. There is so much more to be said about this strange little sproutling. It has licked peoples faces, trying to eat a child, eating 'leftovers' certain someone gave him. Overfed with fish, meat, vegetables, fruit and gods knows what else. All in all, Lyngbakr loves this silly Goobbue like it was his own. Lyngbakr's Thoughts: "Such a sweet little kit, 'tis like she's me own little one. She cares so much ferr others, but do they do tha same?" Mirelia is a sweetheart, a cute little Miqo'te Keeper from the shroud. He got the pleasure of meeting her in a somewhat not-so-pleasant circumstance. It did not take many suns before he found her again on his ship as a Stowaway. Truth be told, he knew that she was there, but he did not wish to alert the rest of his crew of this poor little kit that has seen so much in so little time, so he did the only right thing to do, keep her in his cabin until they reached shore. Minox Moks, (♥♥♦● ) - Shadow Sister. Lyngbakr's Thoughts: "Tha time's 'ave been rough on 'er... I pray tha' she does not go blind in tha shadow an' see wha's 'round 'er." While they are not related by blood, there was something about her that made Lyng look at her as a closer than a friend, a part of his family. She is a wandering soul such as himself which shamely makes them not see each other as often as he wishes. She is a good Captain that has given him some good inputs on how to handle troublemakers of a crew, and he deeply appreciates it. Lyngbakr's Thoughts: "She's such a sweet'eart, I'll allway's be ther' ferr 'er." Lyng met Marisaie through the grindstone, when she healed his wounds during battles. The elderly elezen truely worried about the massive armoured mountain as he was silent, not saying a word - yet managed to explain himself to her without using any, She grew fond of him. Over the time of a couple of moons, Lyng became like a son to her, He has protected her whenever he could, even if it was not his battle. Lyng would never let an innocent get hurt while he was watching, especially if there was someone he knew. Marisaie confronted Lyng about what worried her, and felt that Lyng was conflicted with something in his mind, which was right. Marisaie promised then - and still promises, to be there for Lyng when the problem has to be confronted..
Lyngbakr's Thoughts: "Who in seven 'ells is elf?!" A rather strange fellow that saved him back in the time he thought all was lost, well... it was not quite Elf himself saving him. But he did alot of the 'planning' in a figuratively speaking way. Lyng often asks himself "Who in da Seven 'ells is Elf?!" while looking at the strange person. Though, it's good to have a friendly face to share a drink with, and listen to the hyur man nerd out about history as he pretends he's following on anything he says. Lyngbakr's Thoughts: "She realleh loves ta listen ta me stories"
Nai is a rather strange one to know Lyng, He simply whistled after the miqo'te because he didn't want her to be standing alone while his table were almost full of strangers. They got to know each other by Lyng telling one of his many stories he is so fond of telling. But as of late, he has started to care more and more for this Miqo'te as a dear friend, she has no fear of yelling at the big Roe if she feels something is not right. Which is why one of the reasons he respect this woman so much, she has the guts to say when something is wrong, or when something is worrying her. Madam Seraphine, ( � ) - Little, growing pup. Lyngbakr's Thoughts: "I'm Sorreh I couldn't 'elp ya, pup..."
Seraphine always made Lyng somewhat interested in her background, reasoning and wishes, he respeceted them too. This pup is always welcome into the village, The village tried its best to take care of this roaming, wounded pup. He knew so well that she cared, even though her snappy comments or the troubles she got into. It just became too much for him in the end, he still cares for this person as his own daughter, but it feels like she is a lost daughter; he has not seen her since the time she came to him and explained that she was chased by a madman, which he bluntly said he cannot help with. He still feels bad for not being able to help to this day. "I dun't mind tha rain." ■ I will play . ■ I won't play . Links that lead off the wiki, but are relevant to the character. While the below is by no means comprehensive, it's a kind of spring board for walk-up RP. Longer plots that are meant to run for more than a few quick RP's, please feel free to send me a tell so we can work out details if necessary. He's often seen within or around the Drowning Wench. He's often sending his ship to vesper bay for trading. He's often roaming the land trying to find a nice relaxing spot to fish. He is a fisherman from the Northern sea, born and raised by fishermen. He attends the Grindstone whenever he can. Template adapted from Bancroft Gairn, with edits by Xheja Rajhera, inspiration from D'lyhhia Lhuil, and more edits by Glioca Sargonnai and tweaks by Minox Moks. Please leave the link-backs if you use the theme for anything. This page was last edited on 20 February 2016, at 10:59.